The Albanian mafia and its way of generating revenue has attracted the attention of Italian media. 'Rai 3' has landed in Tirana and is investigating where the dirty money being invested. The Albanian investigative journalist Klodiana Lala is also part of the chronicle, saying that Albania is in a state where it is not only about the cooperation of the politicians with the crime, but according to her, the mafia has also entered in the Parliament. The construction sector continues to be the preferred area for money laundering, she adds. RAI 3 also highlights the threats that the Albanian journalist has received from criminal groups, but she says she is not afraid when she tells the truth. "Many money from illegal trafficking, such as drugs and prostitution, have come to Albania. A good part of the constructions made in the country have come as a result of these revenues." This is the what Klodiana Lala says during an interview to the Italian television Tg3. Pier Damiani D'Agata and Claudio Rubino traveled from Rome to interview Klodiana Lala. Klodiana Lala, is an Albanian journalist who has dedicated her life and career to the testimony of the stories and acts of criminal groups. "There is no news of new policy co-operation with criminal groups. 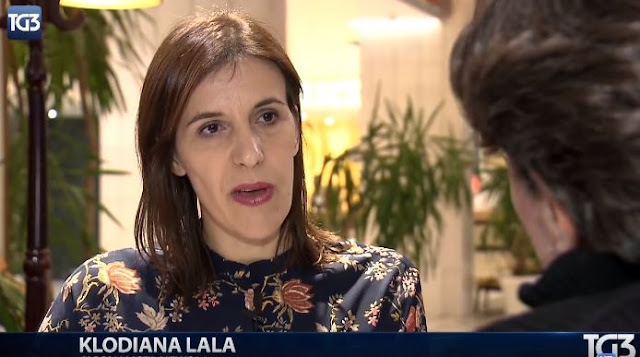 But we have already gone to the point where the mafia has entered in the parliament," says Klodiana Lala. Former Interior Minister of the current government of Edi Rama is accused of international drug trafficking and favoring clans of this spectrum, especially his cousin Moisi Habilaj, condemned by the Catania Court. A few days ago, the Italian Anti-Mafia Prosecutor arrived in Tirana and found that the mafia is the biggest investor in the Albanian economy. "The risk is great, the justice is very weak, even after the justice reform in 2016," Klodiana Lala says. In August, the home of the parents of Klodiana Lala was shot with kallashnikov bursts. This was a clear mafia attack. "I'm not afraid. If a journalist tells the truth, there is no need to be afraid of anything," Klodiana Lala says.